PT Behn Meyer Pupuk & Agrokimia joined in the 100th anniversary celebrations of the palm oil industry in Indonesia which was organized by The Indonesian Palm Oil Producer Association (GAPKI) in Medan from 28th to 30th March 2011. 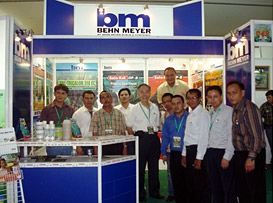 A series of seminars, exhibitions, sports tournaments and charity events were held and Behn Meyer not only had participants at the seminar but also a booth (see photo below) highlighting the fertilizer and agrochemical products which are marketed by the company for use in oil palm plantations. The importance of the palm oil industry, which contributed US$15.6 billion in Indonesia foreign exchange earnings in 2008, was highlighted by GAPKI chairman Joefly Bahroeny. Indeed, the 100 years of commercialization of oil palm planting and its downstream industries have contributed tremendously to the economy of the country. The venue of the celebrations in Medan has historical significance because commercial oil palm planting had started in North Sumatra in 1911. The Pulu Raja estate in North Sumatra and the Sei Liput estate in Aceh were the first two palm plantations to be established. Indonesia has been the world’s largest palm oil producer since 2009 and today, with 7.4 million hectares of oil palm planted, has a total production of 20.9 million tons followed by Malaysia with an output of 17.7 million tons. And in 2011, Indonesia’s production is expected to increase to 22 million tons. Oil palms (see photo above) were first introduced as ornamental plants to Indonesia in 1848 from West Africa. Commercial plantations then began after research by the British scientist William Lever in Africa in the 1900s. Today, because of its high productivity per unit area of land, this “golden” palm is indeed the answer to the increasing needs of the world’s growing population for vegetable oil as food. It cannot be over-emphasized to say that today, without the 12 million hectares of oil palm planted by Indonesia and Malaysia, it would require ten times more land (120 million hectares) to be cleared just to produce the same amount of soybean oil to feed the world - which would be an environmental catastrophe as the world tries to cope with the effects of fast diminishing forestland. Ironically, today, Indonesia and Malaysia are being punished by the unfair campaign from many NGOs who try to hinder the use of palm oil by highlighting certain issues such as clearing of peatland and wild-life conservation, two issues which concern only a small segment of the total land which has been planted with oil palm.